It shouldn't be too taxing. 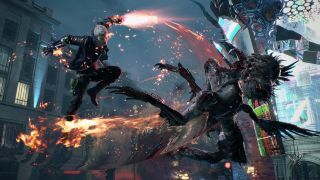 Devil May Cry 5 isn't due till next March, so if your PC's not up to scratch you still have time to upgrade. Judging by its minimum demands, though, you may not need to improve by much—they're pretty modest. You can find the full system requirements detailed below. Satisfy those, and you should have enough power to handle its disposable exploding robot arms and frustrating camera controls. Devil May Cry 5 is set for release on March 8, 2019.